– hosted at the Hilton Garden Inn on Saturday, February 9, 2019, from 6:00pm to about 11:00pm. Tickets include a fabulous dinner, dancing to live music provided by the Mike Banks Quartet, and the opportunity to bid on items in both a silent and live auction! 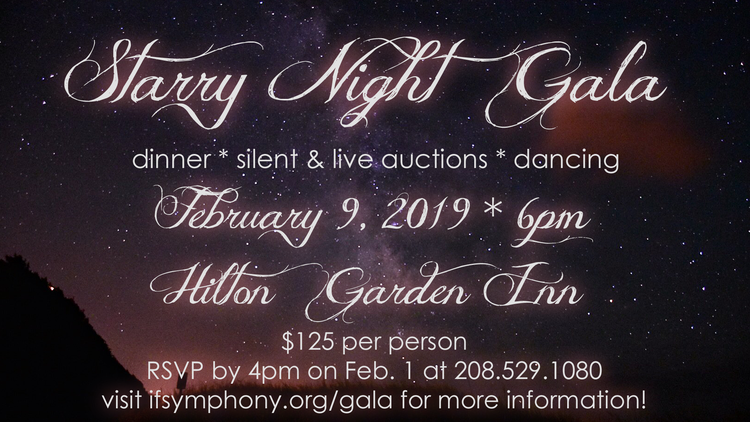 All proceeds benefit the Idaho Falls Symphony in our mission to provide quality, live orchestral experiences of the world’s great music for the enjoyment, enrichment, and education of our audiences and musicians. Don’t miss this opportunity to support YOUR Symphony! Semi-formal and formal attire recommended; themed outfits strongly encouraged! Tickets are $125 per person and must be purchased/reserved no later than Friday, February 1, 2019 at 4:00pm. Reservations and purchases may be made by contacting Penni at the Idaho Falls Symphony office at 208-529-1080 between 11am and 4pm, Monday-Friday, or via email – penni@ifsymphony.org. Check Our Website for Auction & Menu Updates!